Two Missouri S&T chemistry researchers are growing nanowires using electrodeposition. Their work could improve batteries and fuel cells, among other applications. 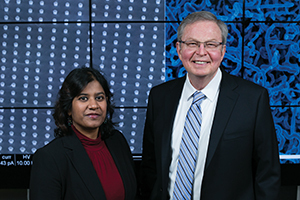 Manashi Nath (left) and Jay A. Switzer stand in front of their respective nanowire creations. Manashi Nath, an assistant professor of chemistry at Missouri S&T, is growing nanowire arrays with a determined diameter and length and a uniform consistency. First she writes a file that creates a pattern for the desired shape and size. Then using electron beam lithography, she stamps the pattern onto a polymer matrix and applies electric current to grow the nanowires. This uniform approach could improve efficiency of solar cells and fuel cells. The wires could also be used in the biomedical field to maximize heat production in hyperthermia treatment of cancer. Nath’s work is funded by the American Chemical Society. Jay A. Switzer, the Donald L. Castleman/Foundation for Chemical Research Professor of Discovery at Missouri S&T, is growing nanowires out of germanium from an aqueous solution. The process, which Switzer compares to growing rock candy on a string, could make it more feasible to use germanium in lithium-ion batteries. Germanium is a better semiconductor than silicon, Switzer says, but it is too expensive to process for widespread use in batteries, solar cells, transistors or other applications. “The high conductivity (of germanium nanowires) makes them ideal for lithium-ion battery applications,” Switzer says. His research, which could lead to a less-expensive way to produce the material, is funded through a $1.22 million grant from the U.S. Department of Energy’s Office of Basic Energy Science.